In this article, we will show you how to identify customer's requirements, conduct survey and translate customer's feedback into actionable plan via Kano Model. Why is Kano Model Important? The most widely used methods to capture the customer's requirement is a survey questionnaire because it can be done at scale. The above example illustrates a common survey instrument. The Likert Scale which consists of 5 or 7 points ranging from the lowest degree to the highest degree literally appears on almost every survey questionnaire. It's also used in conjunction with Rank Order Scaling which asks the customer to rank each requirement so the company can identify high priority requirements. Here comes the pain point. In many circumstances, customers say that almost every requirement falls into "very import" or "important" categories. This situation indicates a high survey bias which is a very common problem. Another headache of the customer requirement survey is that, even though you know requirement by rank, do you know any requirements should be met without fail? Dr. Noriaki Kano indicates in the book named "Attractive Quality and Must-be Quality" that each requirement is not equally important to the eye of customers. Then, the customer's requirement can be divided into 3 categories. "Must-Be" requirement is something basic, the absence of this requirement means the customer is completely dissatisfied. "One-Dimensional" requirements help to increase the level of satisfaction. "Attractive" requirement is something "nice to have". There is really no problem without it, but the level of satisfaction will be maximized if this requirement is in place. Yes, lots of textbooks and articles mentioned this time and time again. But it's very rare to see how to implement this concept. So next section will provide the complete picture. How to Use Kano Model? 1. Gather the list of requirements you would like to test. 2. Ask two questions for each requirement to eliminate bias response and inconsistency. 2.1 The first question (positive question) is to determine how the customer feels if the requirement can be met. 2.2 The second question is to determine how the customer feels if the requirement cannot be met. 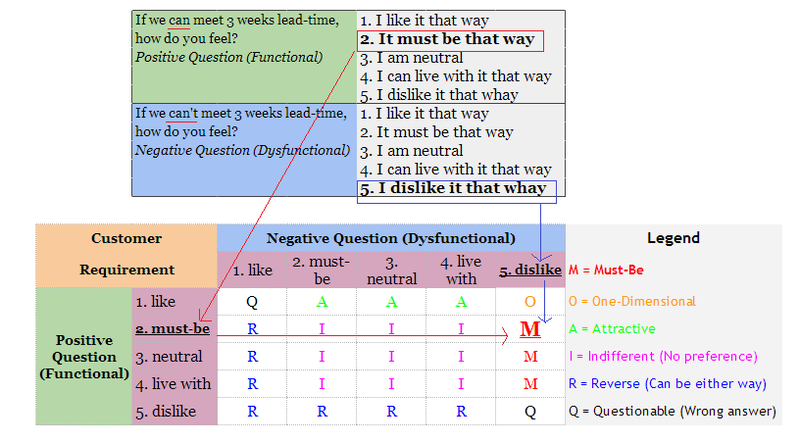 3.1 Suppose a customer says he feels that 3 weeks lead-time is a must (answer 2 in positive question) and he dislikes it if 3 weeks lead-time can't be met (answer 5 in negative question), this requirement will fall into "Must-be" requirement. 3.2 As you can see, negative question in Kano questionnaire serves as a consistency check. And combination of 2 questions for each requirement helps to determine type of requirement. 4. Since you have to ask many customers, you will need to tally the results to determine how a majority of customers expresses their requirements. Determine which requirement you should meet urgently. From the above table, requirement 1 is "Must-Be" requirement because it gets the highest vote among customers. Kano method was originally developed for product design. Anyway, I've tested it in a supply chain environment and found that this tool is actually pretty good. The case study is a supply chain improvement plan at the animal feed distributor. They would like to know how they should improve operations in order to be more competitive in the market. It's generally believed (in many industries) that product price is the number one priority in the eyes of the customer. Anyway, the model has debunked this myth. The survey result in this study indicated that "Quality" is actually a requirement that must be met (Must-Be requirement). Poor quality will result in customer's dissatisfaction and eventual loss of business. This fact took top management by surprise. Then, an initiative related to quality control and supplier development in the upstream farming area got the highest priority. The next step was to improve order fulfillment process because both on-time delivery and lead-time fall into "One Dimensional" requirement which is the next priority. Improvement initiative might include business process improvement and ERP implementation. Do you think Kano Model works well in your situation? - Sauerwein, E., Bailom, F., Matzler, K. and Hinterhuber,H.H. 1996, “The Kano Model: How to Delight Your Customers”, The 9th International Working Seminar on Production Economics, February 19-23, Innsbruck/Igls, Austria, pp.313-327.